Voodoo doll and Mancala have similar effects, but they differ subtly which makes them excel in different situations. In this post we break down their strengths and weaknesses. If you play the Mancala, you reveal the top card of the draw pile. If it is a ware card you receive a good of your choice, if it is a different kind of card you receive a gold. The draw pile in Asante consists of 97 cards of which 35 are ware cards. So, if you play the Mancala you have about 36% chance to receive a ware and 64% chance to receive a gold. If you play the Voodoo doll, you may take a gold from your opponent and place it on the Voodoo doll, or if there is already a gold on the Voodoo doll, you may put a gold from the Voodoo doll in the supply and take a ware of your choice. With the Voodoo doll a player is thus able to take a gold from his opponent in one turn, and take a ware of his choice on the next turn. In the long run, the Voodoo doll is better than the Mancala, because on average it returns 0.5 gold and 0.5 ware per turn, whereas the Mancala on average returns only 0.36 ware and 0.64 gold. (Note that in Asante, wares are of much higher value than gold.) But, the Mancala can be better in the short run, because with the Mancala it is possible to get a ware on the first turn you use it, which is impossible with the Voodoo doll. On top of that, the Voodoo doll is subject to more risks than the Mancala. 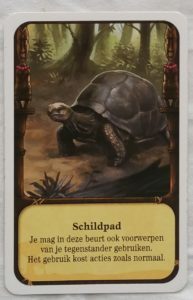 If your opponent plays the Turtle, he may use your artefacts for a turn. If he does this while you have a gold on your Voodoo doll, he can take advantage of this by returning the gold to the supply and taking a ware of his choice. Similarly, chimp and African buffalo can also make you lose your Voodoo doll before obtaining a ware. None of these risks are associated with the Mancala. Finally, we should note that the outcome of playing the Mancala is subject to chance: sometimes this is an advantage, sometimes it is a disadvantage. If you are very far behind on your opponent and you can only win by obtaining a ware of your choice for three turns in a row, then you can win by playing the Mancala and getting lucky, whereas it is simply impossible to win by playing the Voodoo doll. On the other hand, if you are winning and you simply need to obtain one ware of your choice to win, Voodoo doll gives you a guaranteed victory in two turns (baring Turtle, Chimp and African buffalo). Whereas if you play Mancala you could get unlucky for several turns in a row and still lose. Do you not own Asante yet? We like it and find it a unique edition to our board game collection. Read more of what we write about Asante or buy Asante on Amazon through our affiliate link (we earn a commission at no extra cost to you).